I was recently reminded of Gopnik’s sharp assessment of the medium when I visited “Artist-Citizen” at Hemphill Fine Arts. The show focuses on artistic civic engagement—artists that are out of their studios and walking the streets. Mostly culled from the gallery’s stable of artists, “Artist-Citizen” presents works that speak through the city itself. And perhaps because most of the show’s works are on some level preoccupied with documentation of people and places, much of the speaking happens through photography. Take the work by free[space] collective, which consists of artists Billy Friebele and Michael Dax Iocovone. 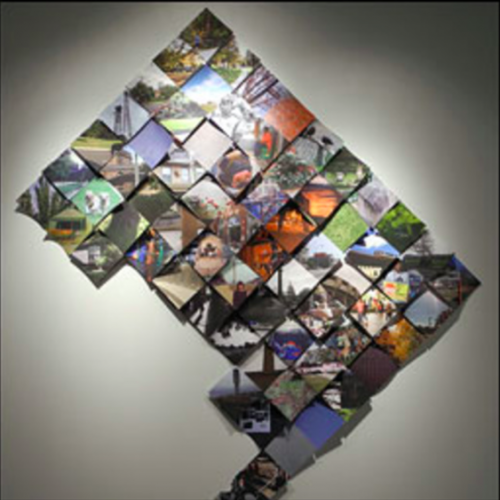 Their project “DC Photo Grid” invites viewers to photograph public spaces in D.C. and to upload the images to the project’s website. The photos are then geotagged, printed, and mounted on a wall grid according to their physical location within the city. Any pretense of authorship is lost beneath layers of meaning—no images are attributed to any single individual, and the photos are cropped before they’re placed on the wall grid, essentially obliterating the original composition. Gopnik thinks that a genius needs to rescue photography, but the ongoing democratization of photographic tools and processes—put to good use with this type of anonymous, collective endeavor—may be what the future of photography increasingly looks like. It’s easy to linger over the blemishes and imperfections in Mike’s paintings while glossing over Hirshfeld’s perfect portraits. Maybe it’s that evidence of human intervention and frailty that photography could use more of.